James Caffrey discusses his and colleague Jamie Stephenson’s new roles as directors at Jackson-Stops’ Chelmsford branch. With 25 years’ experience in the property industry, ranging from luxury villas in the South of France to the London and international property market, I am very excited to be sharing my insight and expanding Jackson-Stops’ expertise in the East Anglian property market. 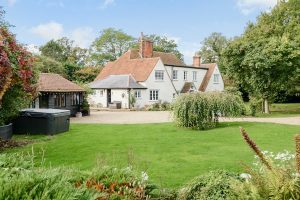 Bearmans Farmhouse is an impressive Grade II listed five bedroom home available through our Chelmsford branch. Jamie and I have worked together for a number of years within an established Country and Village homes division in Chelmsford, and it is here where we developed our detailed knowledge and understanding of the County of Essex, as well as Hertfordshire and Suffolk. Having both lived and worked in the area for many years it felt like a natural progression for us to become part of a team that has had such a strong presence in Essex and provide the central link between Jackson-Stops’ network of London offices and branches in Suffolk and Norfolk. We love being situated between London and the East Anglian countryside as it means we get to observe the natural migration of buyers from the City into Essex and advise on which area will best suit their needs. The Chelmsford branch covers a variety of property types such as country homes, farm and equestrian properties, smaller village and period homes and new build, as well as expertise in land and commercial. If you would like to find out more about us, the Chelmsford branch or the properties we currently have available, contact us on chelmsford@jackson-stops.co.uk or 01245 806101.